When it comes to sunglasses, the goals for most people are fashion, function, and comfort. We at Visual Q Eyecare are adept at finding the best sunglasses to suit your needs, as well as ensuring that they look amazing on your face. Polarised vs. tinted, glass vs. plastic, prescription high-index optical, or transition lens – our expert Practice Manager Simon will make sure you get sunglasses that meet your desires. Some people have issues with light sensitivity. 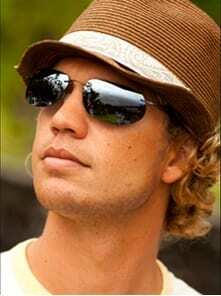 A person who likes to go fishing will often need polarised sunglasses that can take out the glare of a river or sea. Polarised lens are usually UV coated, but tinted and UV coated lens are not always polarised. We believe everyone should have a default pair of polarised sunglasses, and our favourites are Maui Jim and Serengeti. Choose between plastic and glass lenses; each has their pros and cons. Glass lenses are better for clarity, and although thinner, these sunglass lenses are slightly heavier than the plastic alternative. Plastic lenses have less chance of being shattered upon accidental contact. There are high-index plastic lenses made specifically for optics, where the higher the index, the more light they can bend and thus create sharper images. You can get prescription high-index optical sunglasses that work to correct your sight and protect your eyes from the sun. Transition lens are clear until you go outside into the sunlight. Then they automatically adjust to become either grey or brown tinted sunglasses. After you have one polarised pair of sunglasses for general use, you could then look at various other styles suited to different purposes. For example, Adidas makes great sport sunglasses for cycling or mountain climbing, as well as competitive sports like golf or tennis. Rimmed, rimless, plastic (acetate, polycarbonate), or metal … what are the best sunglasses frames? Visual Q Eyecare has a wide range of great sunglasses, of which Maui Jim is just one of the brands we love. Rimless sunglasses are lighter, as the frame weighs less, but it’s a more precision frame to create. These frames are attached directly to the lens, so they need to be mounted correctly. Still, a good pair of rimless sunglasses will be strong enough to handle wear and tear, whereas cheaper models can crack in the joints. The best plastic sunglasses frames are made of acetate and not the cheaper polycarbonate. Make sure you know what you are getting yourself into when making a purchase. Good sunglasses also come down to the level of support given to customers by the brand. 10 years later and Maui Jim still have the necessary parts for their sunglasses, while more fashion focused companies with constantly changing trends can often run out of parts within a couple of years. The truth is, the number of design and style elements needing to be addressed when choosing sunglasses for lifestyle purposes is quite extensive. Most importantly, we need to find a frame and lens shape that suits your particular facial structure. Then we need to look at where you’ll be wearing them, and what kind of personality you wish to express. For example, if you want to exude ‘coolness’ at a trendy local café, there are designs that fulfil this purpose. If you are a woman that needs a ‘dressy’ pair of sunglasses to match the outfit you’re wearing to the Melbourne Cup, then we also have these fancier styles for you to choose from.